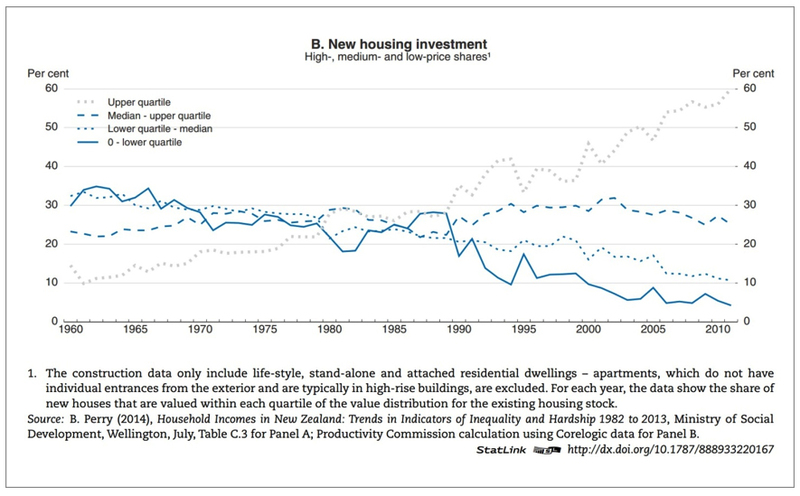 Auckland has a housing problem but this is not just a problem for Aucklanders, or new home buyers. Out of control asset inflation – as seen in the Auckland housing market – is toxic to the real economy, destroying our ability to deliver a long-run neutral balance of trade. High asset price inflation misdirects investment and lowers the competitiveness of the tradable sector resulting in lower average wages and falling returns to trade. Under current conditions investment is largely focused on assets, not productive enterprise. In an effort to check rises in asset prices, interest rates in New Zealand are higher than other countries. Consistently higher comparative interest rates results in a stronger New Zealand dollar than would otherwise be the case, reducing export returns, competitiveness of manufacturers in our domestic market and lowering incentives to invest (key to future innovation, competitiveness and capability). Inequality is worsened, as house and land values contribute to higher living costs; this further damages our economic performance, as recent OECD research has shown higher inequality to be a drag on economic growth. As house prices rise, indebtedness rises in comparison to earnings, increasing vulnerability to economic shocks that can threaten financial stability. Ever expanding debt, supported by banks and the large monetary stimulus programmes in the U.S, Europe, U.K and Japan, and even by the Reserve Bank of New Zealand (RBNZ rules favour land and buildings on bank balance sheets), fuel ever higher average house prices with respect to average earnings. This process is supported by the notion that prices will always rise and that debt will be paid by the (tax free) capital gain. The risk to stability is, of course, if prices fall. Research by the OECD estimated when household debt rises above trend by 10 percent of GDP there is a 40 percent chance of the economy entering recession in the following year, compared to 10 percent likelihood when household debt is rising at trend. More generally, recent OECD research looking at the role of finance and growth suggested the following is the case in most OECD countries: more credit to the private sector slows growth; more stock market financing boosts growth; credit becomes a stronger drag on growth when it goes to households rather than businesses; and bank loans slow economic growth more than bonds. 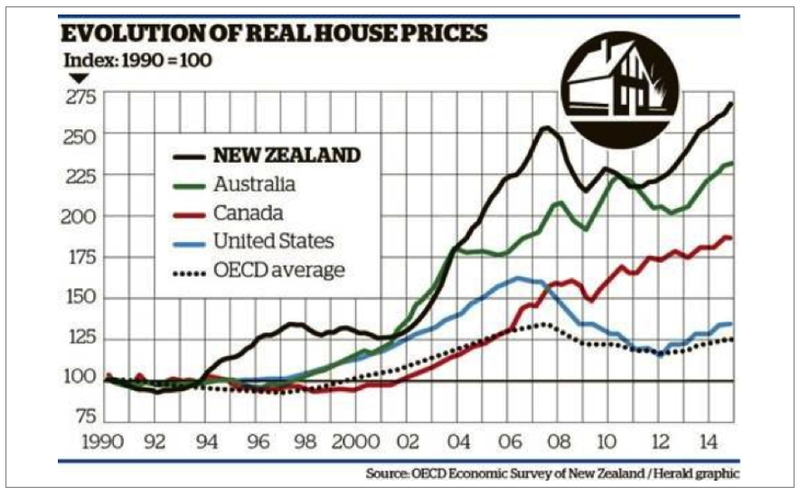 Auckland house prices are high when compared to incomes. 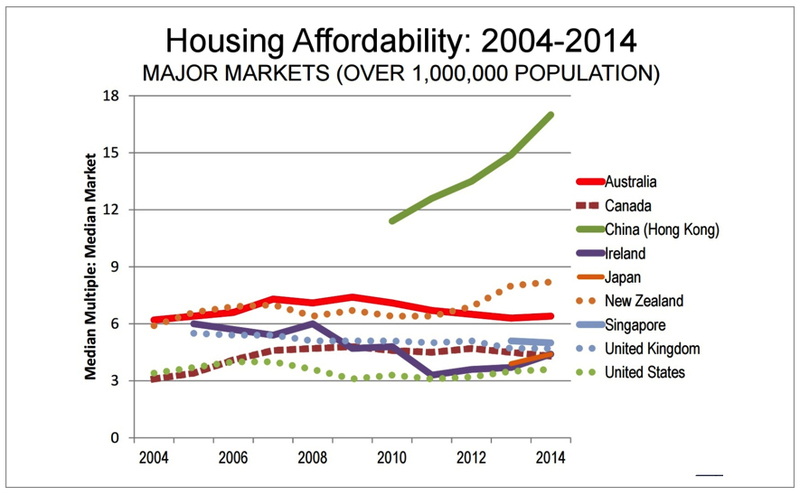 The graph below compares housing affordability (the ratio between median house prices and median annual household income) for each countries’ major markets – for New Zealand, this is the Auckland housing market. As of September 2014, the median house sale price in Auckland was 8.2 times median household income – the survey median was 3.8. The New Zealand national median house price-to-income ratio is also high, at 5.2. Demographia defines income multiples of 5.1 and over as ‘severely unaffordable’. Household debt reached a peak of 162.2 percent of disposable income in the first quarter of 2015, after previously peaking close to this at 161.2 percent in the second quarter of 2009. New Zealand’s household debt-to-GDP ratio is at 95 percent, down somewhat on the peak of just over 100 percent in 2009. Research by the Bank of International Settlements (BIS) suggest that household debt over 85% of GDP can damage an economy, though greater sensitivity to economic downturns, and by boosting debt for non-productive assets, pulling resources from the rest of the economy to service it, including skills and investment. This is the problem – for the whole New Zealand economy. Will building more houses in Auckland fix it? 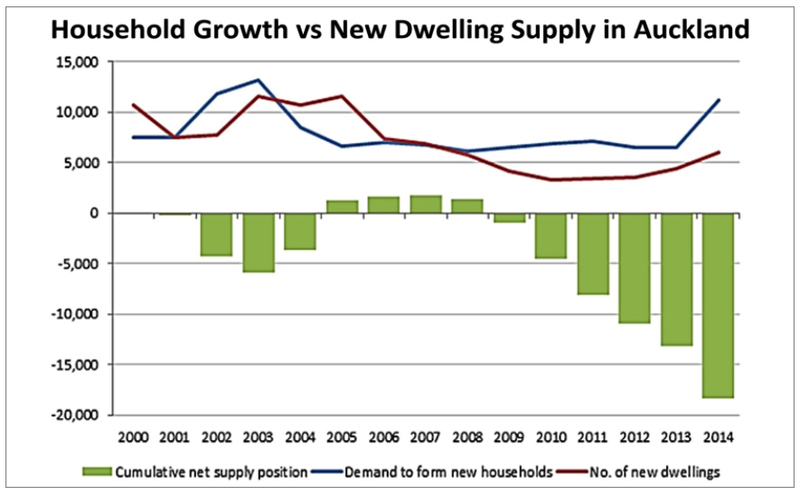 Under-supply of housing naturally leads to higher prices, particularly with high net migration. Hence the solution to this part is to increase supply, open up new land for development, focus on increasing the number of houses built and responsibly reduce constraints and barriers to new builds. It is also important that such developments target high density development, particularly in larger cities such as Auckland, to reduce the cost of urban sprawl (some commentators have called for a debate on migration). But supply side activity has a limited pace as the allocation of finite construction resources and labour has a limit, made worse when in catch-up mode, as seen in the large deficit in the cumulative net supply position in the graph below – this is a key area for the Government to do more, especially ensuring affordable housing is built. Low rent inflation suggests investors and speculators are contributing to house price inflation. Supply side efforts take a while to take effect, and the threats to financial stability and the damage to the tradable sector are with us right now. More needs to be done. The supply response in the last two decades has favoured more expensive housing, rather than affordable homes, exasperating the inequality effect. Intervention on the demand side, such as a register of foreign buyers, borrowing limits related to asset earnings and/or buyer earnings, higher deposits for landlords and capital gains enforcement can act quickly to reduce the growth in debt, slow price rises and thereby improve financial stability. 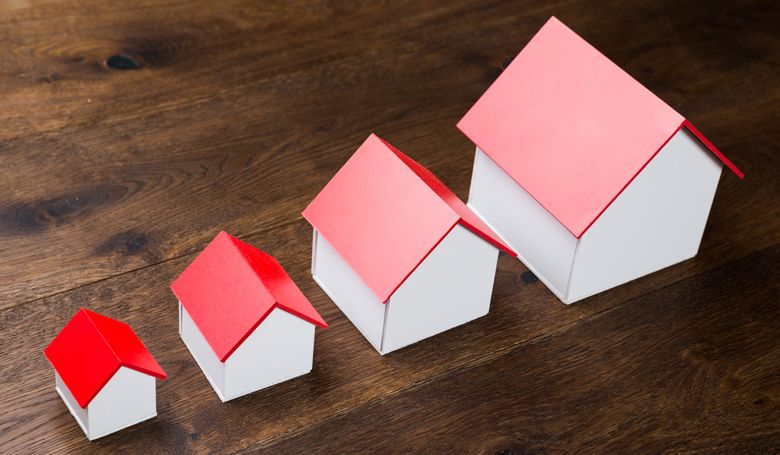 Last year the Bank of England reintroduced Loan to Income Ratios, where no more than 15% of mortgages issued can exceed a Loan to Income Ratio of 4.5. If you earn £100,000 a year, your loan would be capped at £450,000. The Central Bank of Ireland introduced Loan to Income Ratios, of 3.5 times of gross income and Loan to Value Ratios set at 80% (a 20% deposit is needed) with a lower ratio of 70% for those buying rental properties. For first home buyers this is set at 90% for properties up to €220,000, with 80% on any value exceeding this. This tougher requirement on rental investors reflects their higher default risk as compared with owner-occupied homes. Research by the BIS suggests that such macro-prudential tools can be effective in slowing house price inflation and mortgage credit growth if they are introduced at a time when these are both high. In other words, they can be most effective in slowing a boom, and are less invasive at other times, keeping the lid on gently. Another issue often cited as a factor increasing prices is demand from foreign investors. Unfortunately with no register of such ownership in New Zealand it is hard to judge the extent of this. Singapore introduced stamp duty taxes on non-resident buyers of property. This tax now sits at 15%, increasing from 10% when it was introduced in 2012. They also introduced a cap on debt repayment costs at 60% of the borrowers’ monthly income. These measures have seen prices fall 4% in 2014, and sales volumes falling. Australia: there are proposals to introduce such a register as well as fees on foreign investors: A$5000 fee for property up to A$1m, and investments over A$1m would incur an A$10,000 fee for each additional A$1m purchased. These measures are probably too small to make much difference but are a start. Foreign investors are limited to purchasing new build, and not existing property, and these rules may be strengthened. The state of Victoria is now also planning a 3% tax on foreign buyers of property. England, Ireland and Australia also have some form of Capital Gains Tax. While we have seen positive steps forward by both the RBNZ and Government in addressing these issues, wider reform is needed. Limiting the expansion of private debt to both earnings and equity is important not only for those trying to buy a home, but to reduce the impact on competitiveness of the tradable sector through the exchange rate channel and cost of borrowing. More generally, the Government and RBNZ need to stop shying away from strong demand side changes, being sufficiently bold to tackle hard issues around the treatment of asset debt by the RBNZ, and fiscal policy changes by Government around the capital gains incentives. 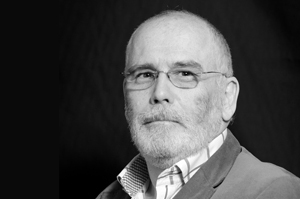 John Walley has broad experience of international manufacturing and distribution companies in the marine, vehicle, electronics and software sectors. He is a Director and shareholder of Imarda, PowerHouse Ventures, and ProActive Software (Chair), he has a number of investments in high technology companies including Adherium. After 16 years he retired as the CEO of the New Zealand Manufacturers and Exporters Association in March 2015, a former director of Hamer, Stabi Craft Marine, Industrial Research, Crop Logic, Modlar, and past chair or Canterprise and NanoCluster Devices. Previously an executive director of the Gallagher Group, manager, engineer with Thorn EMI, Rolls Royce Motors and the General Electric Company in the UK. He holds an Honours Degree in Electrical Engineering, is a Chartered Engineer and a Fellow of the NZ Institute of Professional Engineers, the NZ Institute of Management and a Member of the UK Institute of Electrical Technology.